There are a few reasons why buffalo (or bison) roll in the dirt, but the simplest answer is that it just feels good. Many birds and mammals roll in the dirt, including possibly your pet dog or cat. When an animal rolls in the dirt it is basically giving itself a dirt bath. We may think of dirt as being, well dirty, but animals see it differently. Water was not always available for animals to bath in, so over time they figured out that rolling in dirt could do just about the same thing. It is a behavior that buffalo cows pass onto their calves, just like your mother taught you to wash behind your ears. 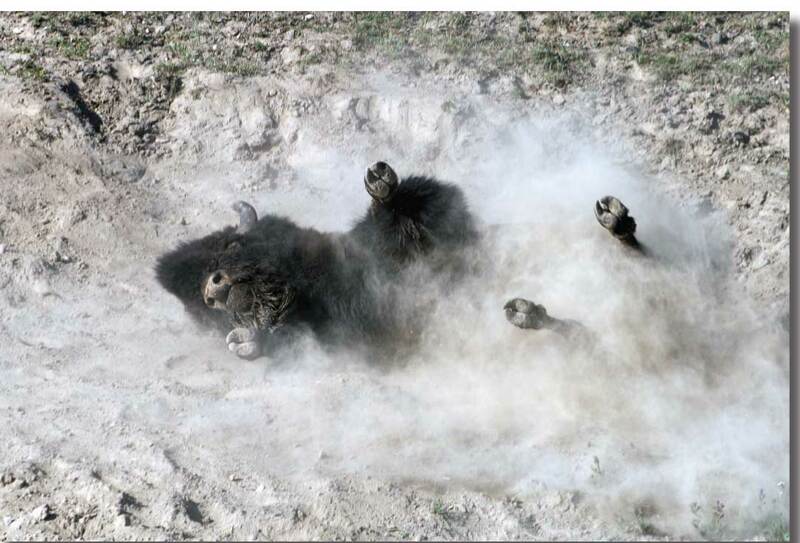 Rolling in the dirt not only helps a buffalo to remove loose hair from its last winter’s coat, it also helps to chase flies off. Also, the dirt leaves a protective layer that helps make it more difficult for flies to bite the buffalo’s skin. When it comes time for the mating season, many buffalo bulls will use wallowing not only as a way to leave scent behind for potential mates, but will actually show off as they roll around, sort of like flexing their muscles at the beach. Their hope is that the female buffalo will be so impressed by their gymnastics and all the dust flying that they will want to get to know the bull. Humans aren’t the only ones who like to show off! You have been taught by your parents that one way to stay healthy is to keep your body clean. Nature must have taught this same important lesson to the rest of the animal kingdom because almost all creatures have developed some method of cleaning and grooming themselves. 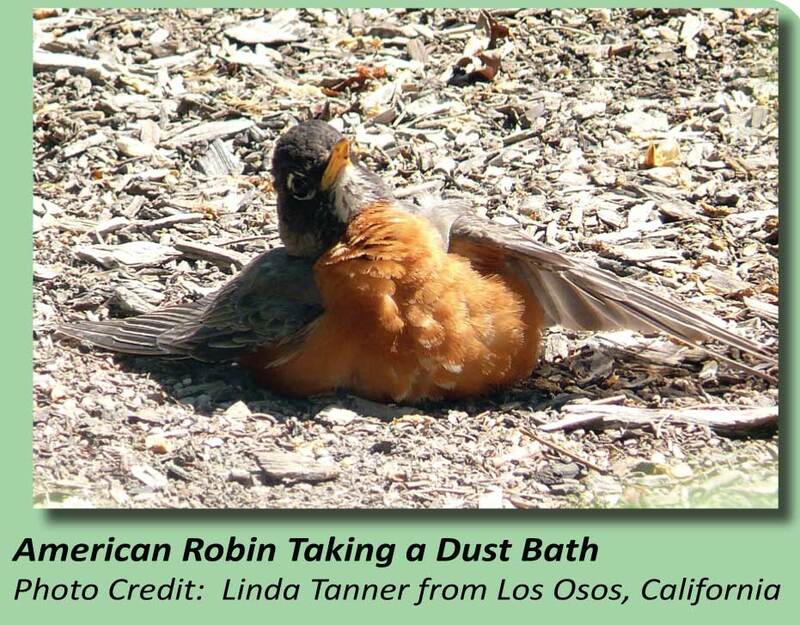 Some mammals and birds take dust baths. The animal looks for a spot where the soil is either sandy or powdery dry. Then it lies down, rolls about, kicks out its legs, pulls itself in circles, and finishes the bath with a leap and a shake. This dust bath will absorb the dirt and skin oils from their fur or feathers, giving them a healthy, fresh sheen. Let’s experiment to see how well oil can be absorbed by dirt. Measure 1 tablespoon of oil into each of the plastic lids. Let the oil spread. Measure 1 tablespoon of each of the following materials on top of the oil: dirt, kitty litter, sawdust, sand. Wait 24 hours. Observe how much of the oil is left unabsorbed in each of the lids. Does dirt do a good job of absorbing oils? Questions for further experiments: Does it matter how wet the dirt is? Would dirt from a different location change the result of my experiment? What are the rules about having bird feathers in my possession? Can I pick up a goose feather from the Greenbelt? ← How long do cacti live? How do they spread (seeds or something else)?